It's been almost a year since we got Cade's diagnosis. How are things going for us now? 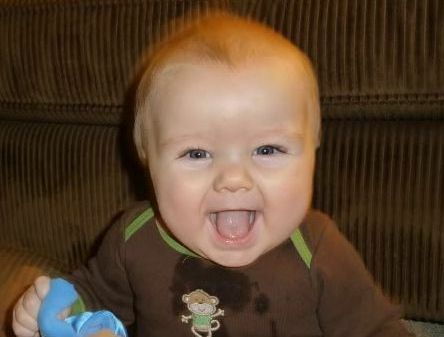 Cade is 7 months old (we got his diagnosis when I was 5 months pregnant). He's eating solid foods, sitting up, and has two teeth. 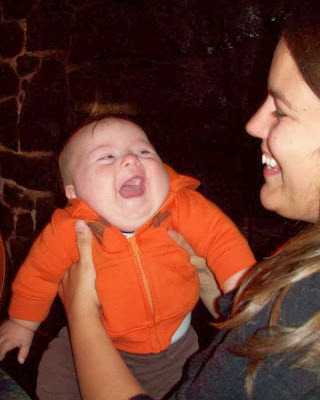 He's generally a happy baby, but not "always happy" the way that you hear. He has the same emotions as everyone else and lets us know when something isn't going his way. Camille and Colby adore him and think he's the best baby ever. Their relationship is great. Shannon and I can't imagine not having Cade in our family. Being his mommy is great. One year ago, I was in tears and wondering why God would do this to us. Today, I'm so thrilled that "God did this to us." Cade is perfect and wonderful and we're doing GREAT! Hang around Facebook long enough, or most anywhere else, and you'll find hurting people. But many times, no one knows they're hurting. They suffer in silence, reluctant or unable to share with the world. 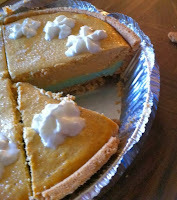 I'm going to use my sister-in-law as an example, because I'm pretty sure she'll forgive me. 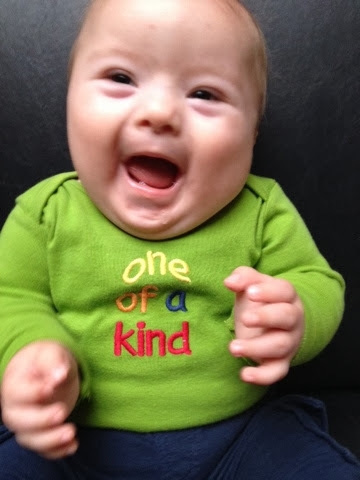 Last year, at exactly this time, we started our journey in the world of Down syndrome. 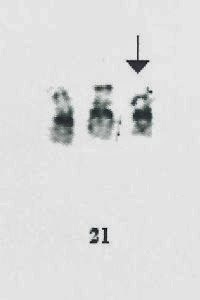 From the first question mark to the diagnosis took almost a month. That time was utter hell. Believe me when I say that waiting for bad news can be harder than finally receiving it. We chose not to tell anyone, not even our mothers. We didn't want to worry anyone because, surely, the tests would end up being negative. We honestly thought it would all blow over and later we'd laugh nervously about how close we'd come. So we suffered silently, just the two of us. Thanksgiving Day was brutal. BRUTAL. It stands out as one of the hardest days of my life. We had just had The Big Ultrasound a few days prior and everyone was expecting us to reveal the gender of our new little one. But unbeknownst to all, the big ultrasound wasn't much fun since it showed that our son had a 1:3 chance of having Down syndrome. We went ahead with our gender reveal, but in the photos I look like I'm about to cry. That weekend, despite the rain, we decided to go look for a Christmas tree. It was cold, and drizzly, but we were determined to have fun for Camille and Colby. Our hearts were heavy as we trod the tree stands, looking for the perfect tree. 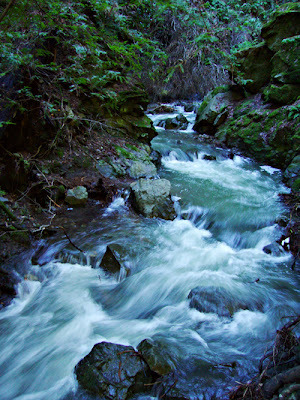 As we went, I posted pics to Facebook. Camille by a tree. Colby helping cut it down. The two of them dragging it to the car. When I got home, I had a message from my sister-in-law. She was upset that we hadn't invited her. And so she posted on Facebook how we should have been more thoughtful. I cried as I deleted the post. An hour later, she posted again. I sobbed for an hour. I'd been through the hardest 10 days of my life and I had at least 10 more to go before we got our final diagnosis. I was crushed, broken, not sleeping. I was doing my very best to hold it all together for the sake of our kids. To my sister-in-law, whom I adore and love, it was a missed opportunity to spend some family time. 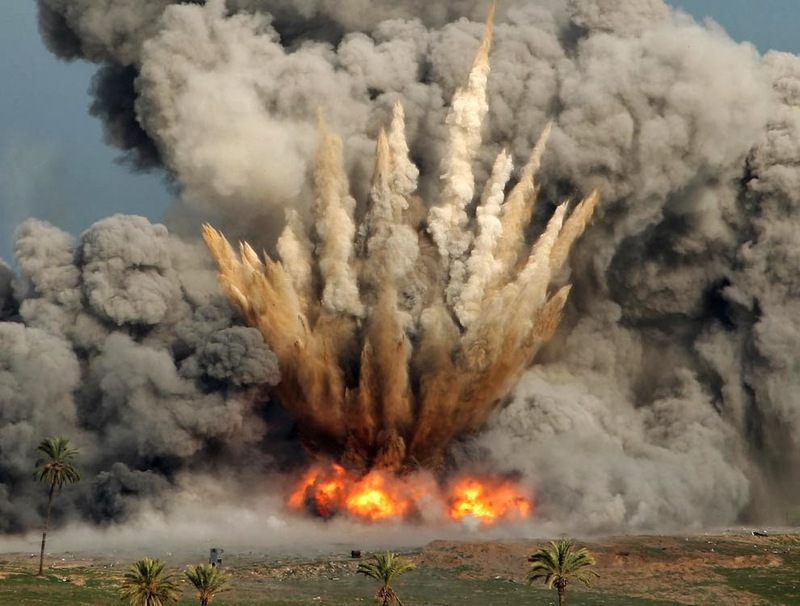 To me, in my heart I was facing WWIII and I didn't give a rip about a tree. 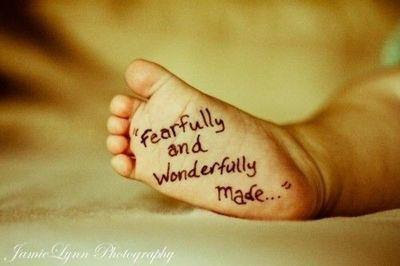 So today, as we go into a new holiday season, I want to give a gentle reminder...tread softly. Think before you speak. If your friend offends you, give her the benefit of the doubt. She may very well be dealing the best she can with something beyond her control. I don't really know what to say, but as the tears roll I wanted to update on little Rosie, the baby I was fundraising for this year. I just received an email from Reece's Rainbow that Rosie has died. I don't know when or from what, though I do know she was never very healthy and had had a heart condition that was repaired surgically. In just over 24 hours, we raised $220.50 for Rosie's adoption fund, 1/5 of our 2-month goal. I know we would have made it to the full amount with no problem. I'm crushed by Rosie's death. I chose her because she looked a bit like my own Cade. I've been praying over her since September when I committed to being her "Angel Tree Warrior". And I was excited to maybe play a small role in her finding her forever home. Today, I'm brokenhearted. I do find comfort that Rosie didn't die without love, for even though I never met her, I thought of her daily. 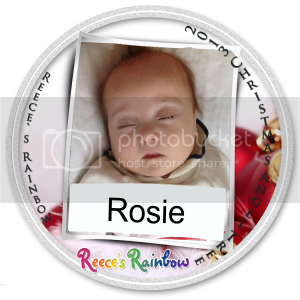 And Reece's Rainbow is letting me choose which child Rosie's fund will pass to. I haven't made that choice yet, but it will be another child with Down syndrome from the same country. Anyway, thank you for supporting me and Rosie by your donations and God bless. I'm holding my baby a bit closer and I hope you will, too. Update 2: On 11/7/13 I found out that Janie has found her forever family! A family found her via the Angel Tree program and has committed to loving her forever. I'm so happy with this news. 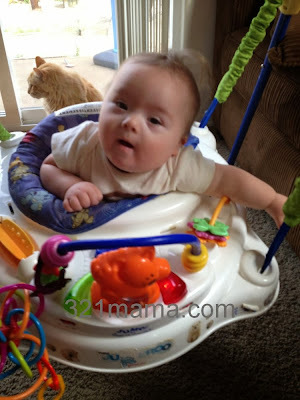 Reece's Rainbow is a website dedicated to helping children with Down syndrome find adoptive homes. 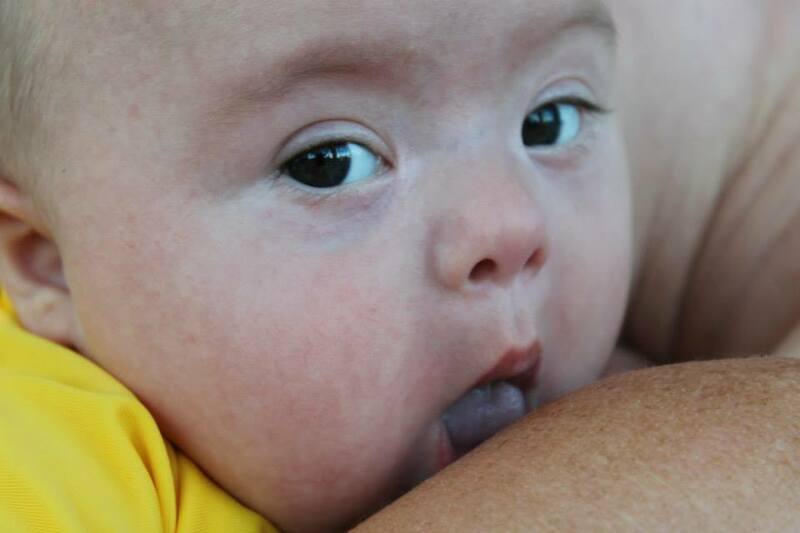 Worldwide, children with Down syndrome are viewed as worthless, shameful, and completely without value. In many countries, there are simply no resources whatsoever for raising a child with special needs. Very often, these children end up in orphanages, where they spend their childhoods without love or family. Sometimes they lack even basic nutrition, fresh air, and necessities. Thankfully Reece's Rainbow has stepped in to offer hope. And each year at Christmas, they have a unique program to help raise money for each child's adoption fund. That way, when an adoptive family is found, there's a starter fund to get them going. 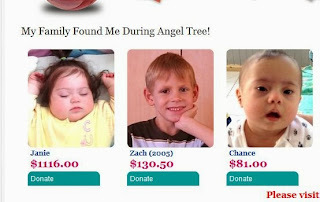 This year, in honor of Cade, I decided I could help a child find her forever family. A friend sent me this photo and I couldn't help but see the resemblance to Cade. Rosie was born in August 2012. She has Down syndrome and a heart defect that was repaired by surgery in March 2013, the same month Cade was born. She's often sick with fevers and bronchitis. 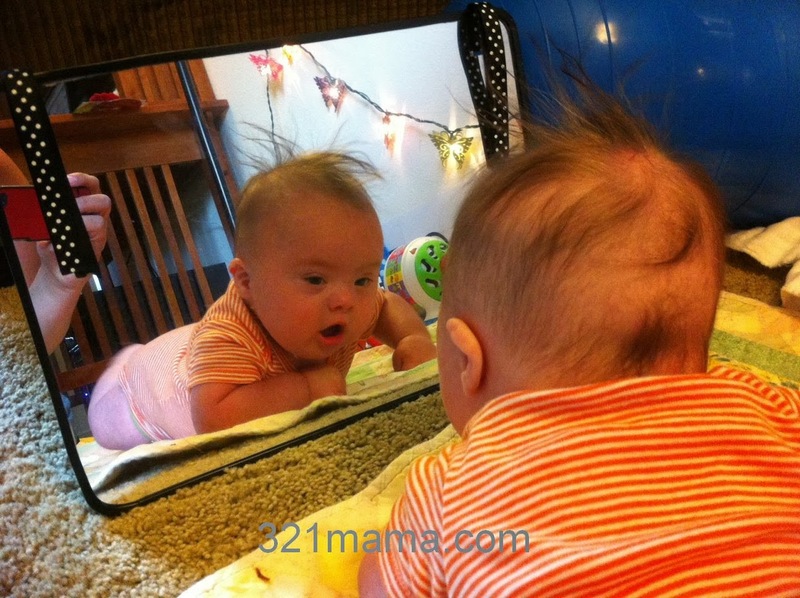 At the time of her listing, she was working to learn to roll over, just as Cade is now. Rosie had my heart and now for the next 2 months, she'll have my help as well. My goal is to raise $1000 for Rosie's adoption fund. We aren't adopting her, just helping to start her fund for her future adoptive parents. And who knows, maybe someone who sees her because of my efforts will fall in love and she'll find her forever home with one of YOU. There are lots of ways to help. Mommy guilt: It's never enough. Today I'm feeling vulnerable. We had a rough night and I'm not feeling well. Shannon took the kids out so I could rest. 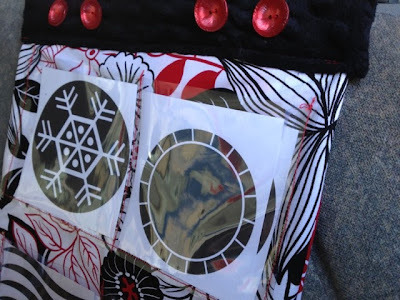 Instead, this blog post bobbed to the surface of my mind and had to be written. Mommy guilt. We all feel it, I think it's universal for mothers of all ages. Certainly I've had my fair share while raising our older two kids (currently 8 and 3). But I've always consoled myself that if I screw up, they can still find their own way in the world. 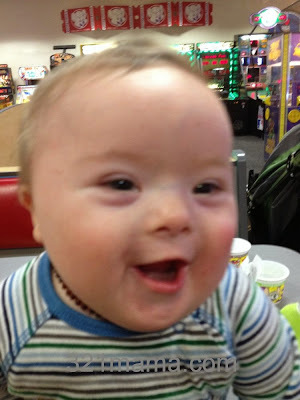 Lots of groups post stories online about kids with Down syndrome who grow up to have amazing abilities. I even track some of them on my own blog. Professional photographers, renowned dancers and artists, violin prodigies. And the back story for many of them is parents who followed an aggressive therapy regimen. These stories are posted with the intent to encourage...see what your child is capable of doing! Your kids have unlimited potential! On most of my days, I love these stories because they do encourage me. But on my mommy guilt days, I feel awful for not doing enough therapy with Cade. For skipping days altogether, for forgetting particular exercises. And then I think, is he behind because of me? My concerns aren't baseless. Research has shown that the more therapy a child receives, the better they do later on. The reasons for this aren't clear. Is it the therapy itself? Is it the result of more time and attention from parents? The questions cascade. Would he be sitting up now if I did his therapy religiously? Would he be able to roll from belly to back if I worked harder with him? If I buckle down, will he walk before he's two? If he gets behind now, how much farther will he be behind when school starts? I feel that I'm failing him. Every day that I'm "too busy" to complete the therapy exercises is a day lost forever. Isn't Cade more important than my to-do list? Of course he is. I don't have any answers today. What I do know is that while today may be a waste, tomorrow is not. God has a fresh batch of hours and energy waiting just for me. At 7 months, he LOVES the jumper! 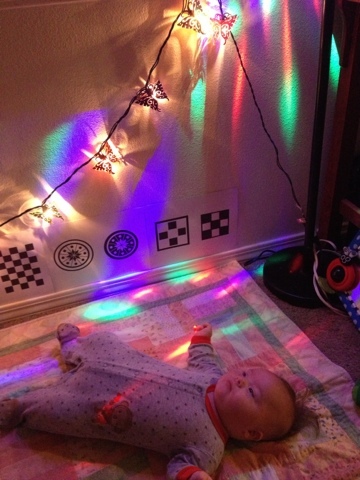 He finally plays with the toys and can bounce a little to make the music play. 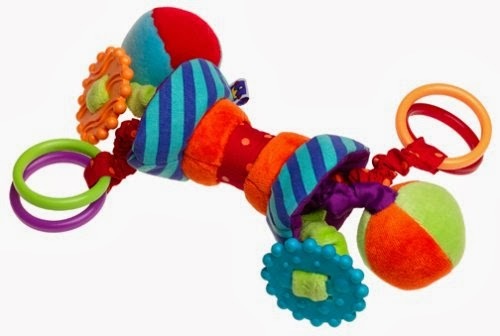 Here are some of the toys that Cade likes best between 4 and 8 months. Bright Starts Rattle and Shake Barbell Rattle - the thin bars between the rattles are perfect for gripping. The whole rattle is lightweight enough that it's easy for him to shake. This was recommended to us as a great choice and sure enough, they were right. 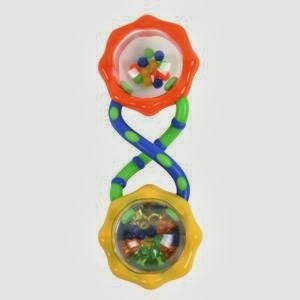 Manhattan Toys Ziggles - Cade loves this toy because of the little rings. They're just the right size for him to grab and then every movement he makes produces a jingle or rattle. I often hang this one from his car seat because it's long enough for him to reach and there's enough going on to keep his interest for quite a while. 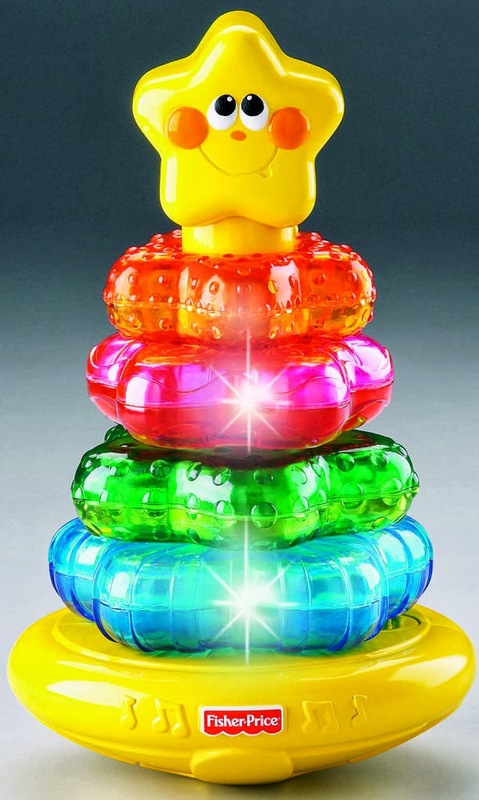 Fisher-Price Super Star Classic Stacker - With lights and a not-too-annoying song, this stacker has been a favorite in our house for the past few weeks. I can balance the smaller two stars on top of the stacker and then Cade's touch will cause them to fall and start the music. He loves it! This is one that we use a lot while we do his sitting therapy. 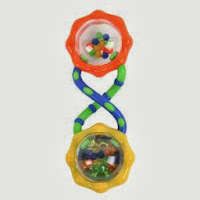 Manhattan Toy Winkel - after a zillion moms from my online birth club raved about this toy, I caved in and bought it. Cade loves this thing like it's his very best friend. 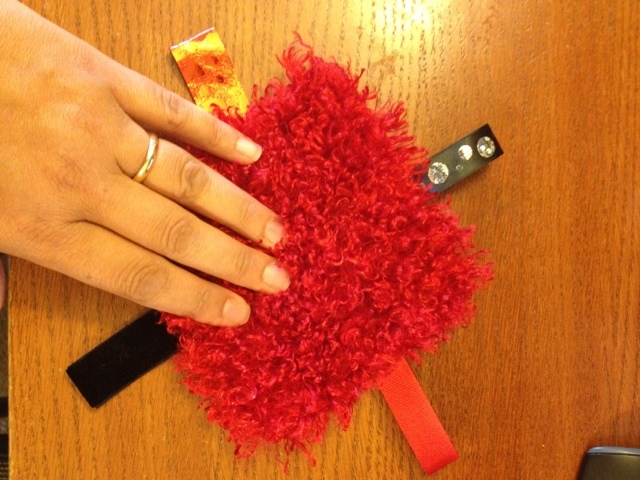 The loops are small enough that they're easy to grasp and it's so lightweight that he has no trouble holding it. 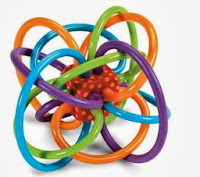 The loops are also great for mouthing, so this has really helped him learn to bring his hands together at midline, then direct the toy into his mouth. Our OT saw this the other day and she said it's one of her top recommendations for babies. I can see why! This list is a work in progress, so I'll be adding to it over the next few weeks. For now I'll get this posted for part of the 31 for 21 series. In my "before Ds" life, I knew a few families who had some sort of therapy for their kids. 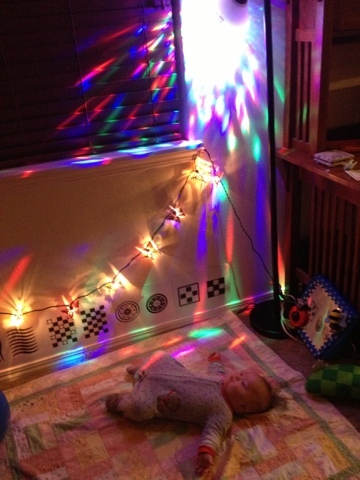 And I always wondered, how do you do therapy on a baby? Especially occupational therapy...are they training for a job already? For today's 21 for 31 post, I thought I'd show a glimpse of what therapy is like for Cade. Cade has an occupational therapist who comes to our house twice a month. Her name is Elaine and we really like her. The first time she came, Cade was only 5 weeks old. On that very first visit, she explained about the palate in the mouth, how it forms, and how its formation effects the rest of our lives. The way you eat, the way you drink, how clearly you'll be able to talk, etc. 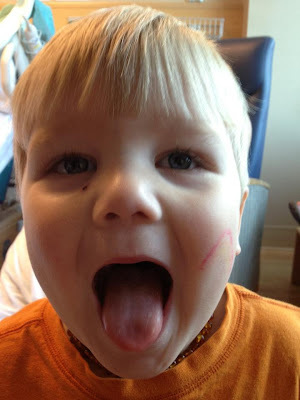 Cade's first set of therapy exercises were oral. I massage the roof of his mouth in a certain way 3-4 times a day. I rub his gums and teach his tongue how to curl for proper swallowing. 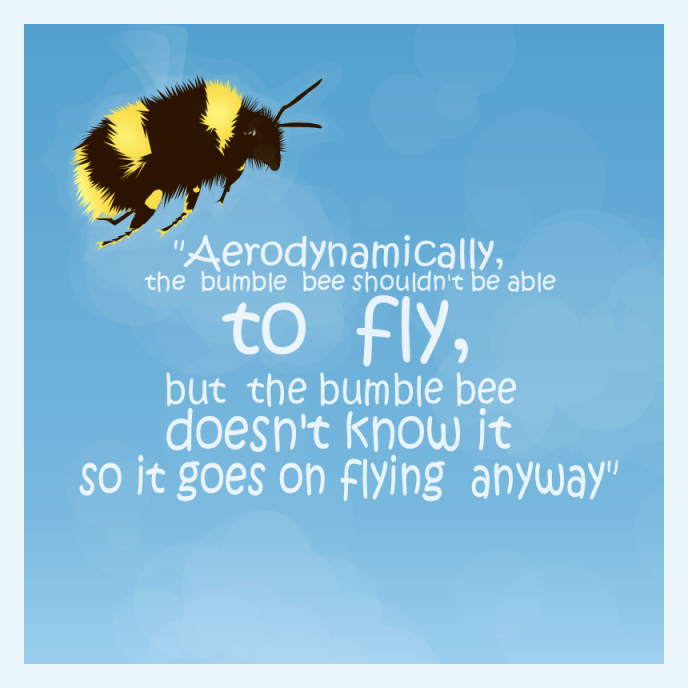 (This usually falls under speech therapy, but our OT also does ST work.) Here's a fantastic video of a dad doing the same oral exercises with his daughter. Around 9-10 weeks we started working with a peanut ball to strengthen his legs and core muscles. 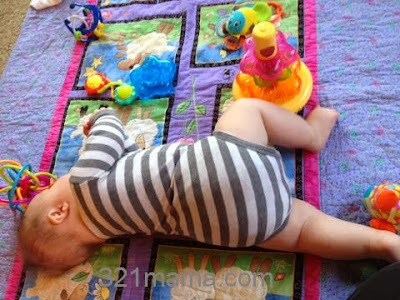 By placing his arms in the proper position, it also helped teach him to raise his head and chest at tummy time and prepare him for crawling later on. Then we moved on to other forms of exercise to help strengthen core muscles. Cade has spent a LOT of time on his tummy. We found a few toys that really helped make this more fun. 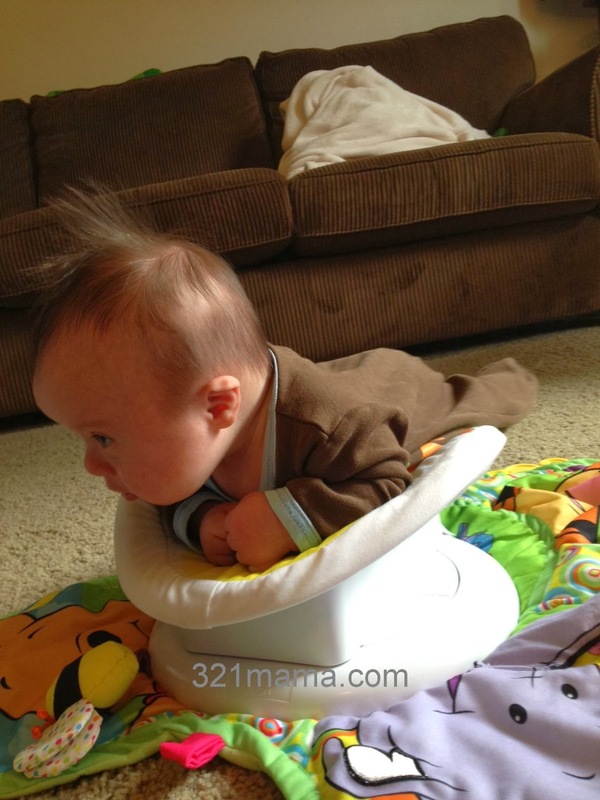 Now that Cade has mastered tummy time, lifting his head, and propping himself up on his elbows, we focus more on the muscles needed for sitting. That was one surprise for me: that each muscle group is conscientiously worked until the goal is achieved. With our other babies, they didn't need our help learning to sit. We propped them up a few times and then they did it on their own. Cade would eventually learn on his own, too, but if we can give him a head start then he'll learn other things, like crawling and standing, more quickly. My lovely dirty-mirror photos of Cade. Taking the pics in the mirror is the only way I can take photos during our therapy! Here he's working on sitting while playing with a new toy. All of the lights and mirrors are part of the visual stimulation mentioned in the Caesar's Palace posts. He's working on rolling right now, too. Technically, he's rolled from both tummy to back and back to tummy, but he doesn't do it intentionally yet. Almost there! Light-up toys like the stacker and small toys that he can easily hold are his favorites right now. 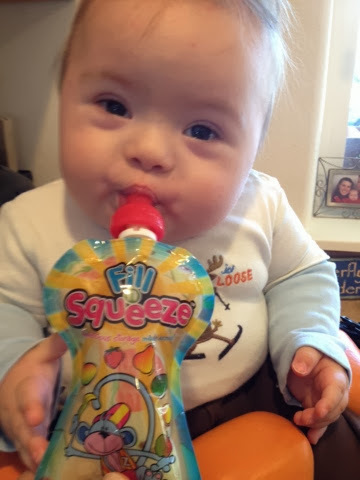 October is Down Syndrome Awareness month and lots of bloggers team up each year to write a blog post every day for a whole month to raise awareness, banish myths, and show off adorable kids! This year, it's my pleasure to participate. My Cade has changed my life (as any child added to a family does) and I want everyone to know that he's pretty much amazing! What's 31 for 21? 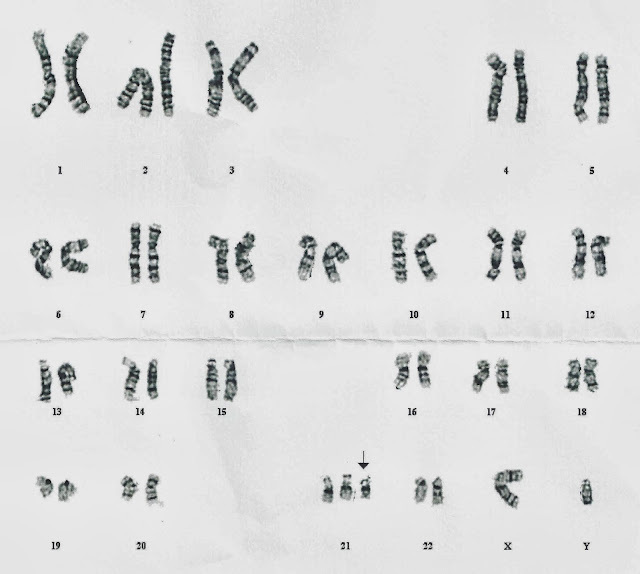 Down syndrome is what occurs when there are three copies (instead of two) of the 21st chromosome. It is also called Trisomy 21. October has 31 days. 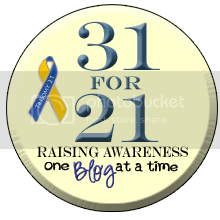 So 31 blog posts to raise awareness for 21. Today is day 3 so I'm joining a tad late. I won't bore you with catch-up posts, I think I'll just start fresh tomorrow. Will I make the 31 (or 29) posts? Hopefully, but maybe not. 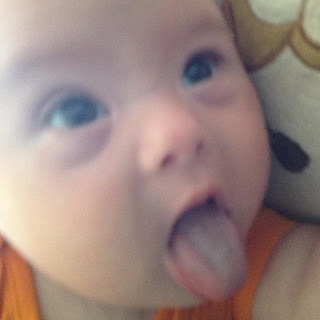 If you actually read any of the posts, will you know more about Down syndrome and what it's like to raise a child with Down syndrome? Absolutely. So please, read along. We'll enjoy the journey together. Cade doesn't play with toys yet. At 5 1/2 months, a typical baby would eagerly grab toys to play. He looks at them, but doesn't even try to hold them. If I put a toy in his hand, it falls to his side almost immediately. He will bat at toys hanging above him, but won't reach out and take it or interact with it. 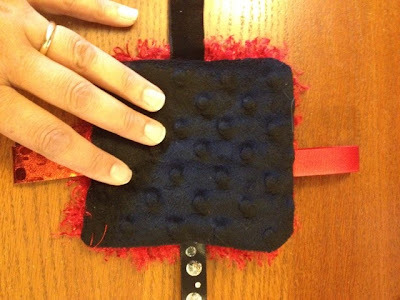 He rolled from his stomach to his back a few times several weeks ago, but never since. This isn't entirely unusual for any baby, but by 6 months most are rolling from side to side pretty easily. He's learning to sit, but needs a lot of support. He still folds in half readily. Cade doesn't seem to recognize his name, or anyone else's. He won't look at mommy when we ask "Where's mommy?" If you were to look at a milestone chart (which I don't do, except for today), Cade is very much like a typical 3-month-old. 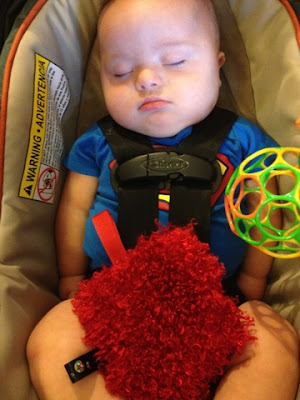 For a child with Down syndrome, this is all very normal. Cade is doing great and he's right on track. He smiles and flirts, he laughs, he loves peekaboo. But yes, he is delayed a little. He undergoes occupational therapy once a month, soon to be twice a month. We work on skills needed for rolling, sitting, etc. Also, medically, while Cade is a total superstar, sometimes things still pop up. Leukemia, seizures, and thyroid issues are very common and often show up anytime in the first two years. So every time Cade wiggles funny, we take note. Any red spot whose cause I don't know, I keep an eye on. 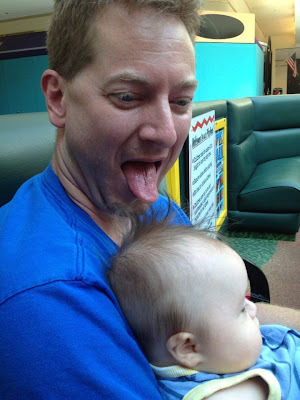 And when we take him to the doctor, our pediatrician takes our concerns seriously. For instance, Cade has had tremors in his right arm and head since Wed, July 24. Every day, usually several times a day. So we had an EEG to rule out seizures. 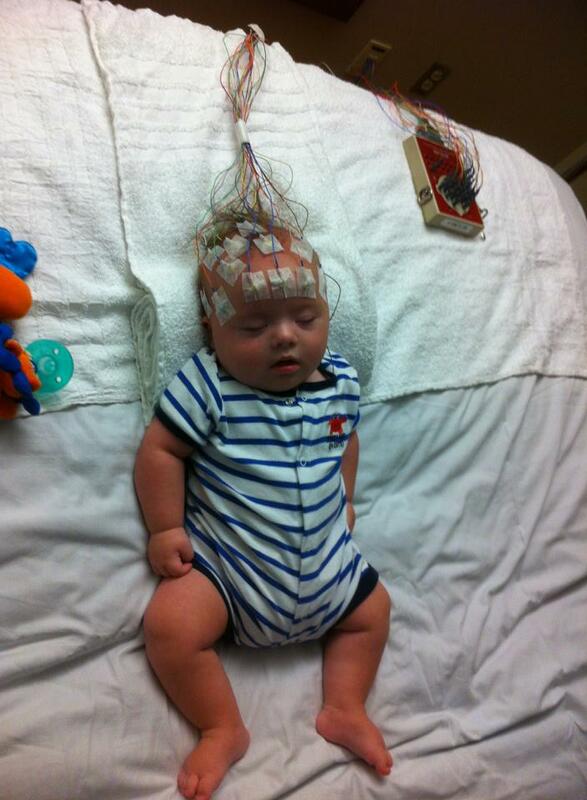 The EEG was normal, so for now we're on a "wait and see" status. At any point, we may have a neurology consult take a look. My reading pile is full of titles like Gross Motor Skills for Children with Down Syndrome, Babies with Down Syndrome, and How Smart is your Baby (a book about brain development in kids with Down syndrome). Most of my new Facebook friends are moms of kids with Down syndrome. It's a pretty great community and I'm honored to be a part of it. Mostly, I'm honored to be Cade's mom. He's pretty amazing! Let me tell you about Down syndrome. It comes with a laundry list of medical complications. A baby can have any number of these issues and often will have multiple issues. He might need hearing aids. Most likely he'll wear glasses. 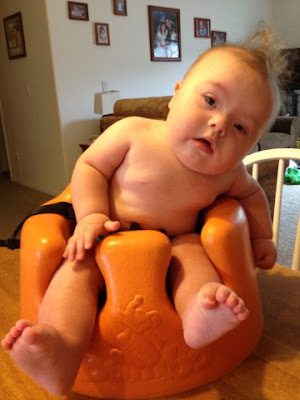 Learning to roll or sit up is difficult because of low muscle tone. 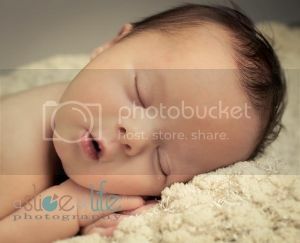 He'll have heart defects and need to go to the NICU after birth. Now let me tell you about Cade. He doesn't have any of that. He never got the memo. He breastfeeds, he eats solid foods, he rolls, he's learning to sit. His muscle tone is almost as good as our other kids'. 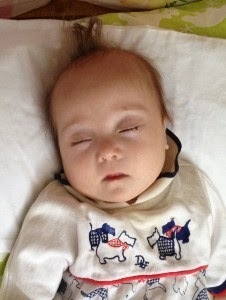 He did have minor heart defects at birth, but miraculously they've all resolved. He poops--usually. His hearing and vision are great. The slogan for this year's Buddy Walk (a national walk that raises money for Down syndrome research) is "Expect me to succeed. I will." We expect nothing less of our other children and we expect the same for Cade. Not a fan of strawberries. *For those who would take this literally, of course we would never keep this a secret. Down syndrome is, and will always be, part of who he is. 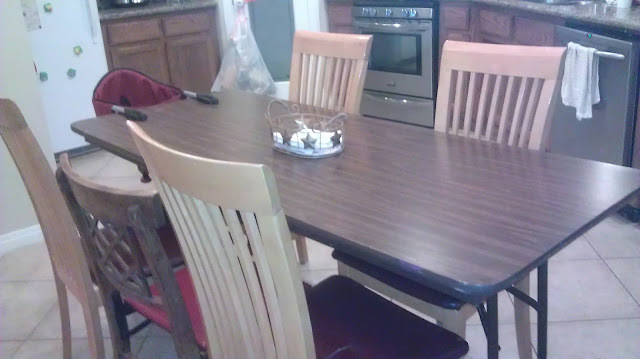 As I was wiping down the dinner table this evening I got to thinking.... Sure it's "just a folding table and mismatched chairs", but it's something more. It's where we eat our meals-together, all of them. It's a family school room desk. It's a conference table. An arts and crafts center. A cooking show stage. A mountain to run around or hide under. 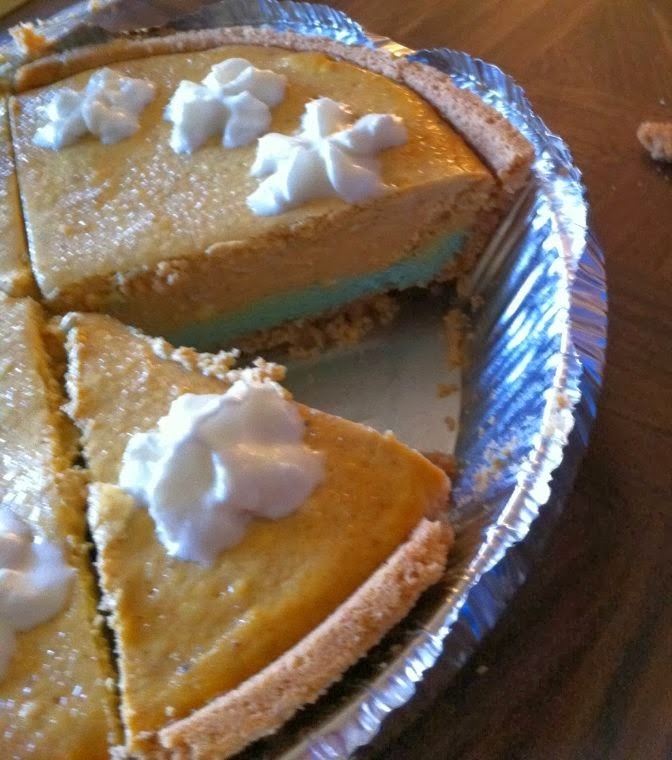 It doesn't have to be fancy. It doesn't have to match. It's where we come together. I've often heard that humor is the best medicine. And so often, it's true! Licking my friend's shoulder...full on tongue, yum! Life is funny. Laugh it up. You know that feeling you get in the pit of your stomach when you are faced with an uncomfortable truth? Often described as "that sinking feeling". Dread. Realization. This happened to Shannon and me this week in separate incidents. Shannon was at a park and saw another dad with a 5-6 month old baby. The dad was bouncing the baby and ducking as the baby tried to grab his nose, his hair, his ears. The baby was everywhere! For me, it happened a day later at a restaurant. Cade got fussy so I put him on my lap at the table. He was very content to just sit. 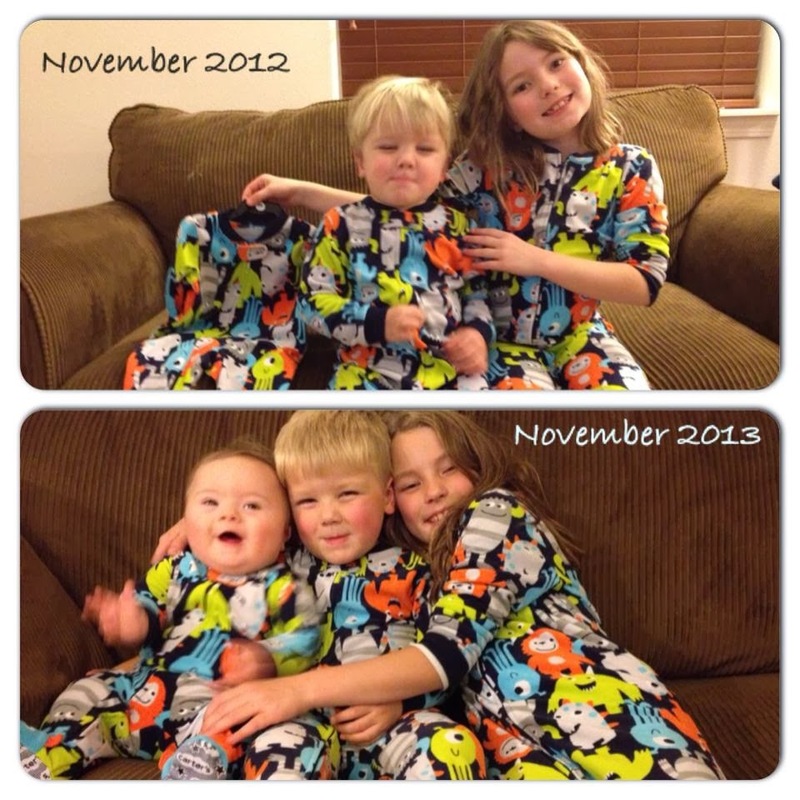 And it hit me...by 5 months, our other two kids had the "10 foot reach". You know what I mean: you have to clear the table of every item because the baby has an impossibly long reach. All glasses and silverware must be safely out of the way. Waitresses always put things within baby's reach, leading mom and dad to dive for said item and pull it out of the way before baby can grab it. Ohhhhhhh, there's that feeling. The lump in my throat. The gnawing feeling in the pit of my stomach. Don't get me wrong, Cade is often very active and loves to wiggle. But he doesn't grab for things on the table. Or for our noses. He's more like...a 3 month old. Oh, there's that feeling again. Now I'm half sick with it. I suspect every parent of a child with special needs has this moment. This realization that "My child isn't normal." In the world of special needs, we'd say "typical" instead of normal, but that first moment of sick realization is not politically correct. 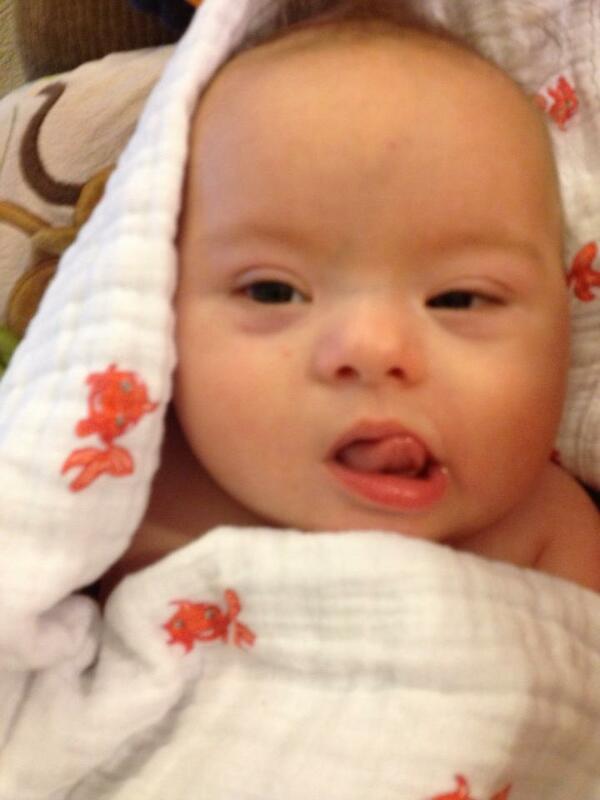 I've known since last November that Cade would have Down syndrome. I've read scads of books, I've researched the latest therapies, of course I know that Cade isn't typical. But my heart doesn't always get the memo, leading to this week's painful realization. Why am I posting this? Because it's on my mind, but also because I want readers to know that my blog isn't "rainbows and unicorns". So far, life with Cade has been very easy, very much like our other children. I don't have big surgeries to write about, or vast disabilities. We don't really even have any "issues." But life isn't rainbows and unicorns. It never is, not with any child. We worry constantly about our kids, disability or no. I worry more about Cade, though, and I watch him every day...Can he see? Will he be able to eat solid foods? When will he sit up? I try not to compare milestone charts, but comparing him to our other kids is just inevitable. I can't help it. In 2009, I had a miscarriage in the 12th week. We'd tried for 2 years to become pregnant and we were overjoyed. And equally devastated when it ended so early. I ended up in the emergency room with massive hemorrhaging. As they tried to stabilize me, the doctors and nurses and technicians flowed in and out of the room. Bright lights, beeping machines, the steady drip of the IV. Through it all, over and over and over, for hours, the song It Is Well With My Soul went through my mind. This song was written by a man who'd just suffered the loss of his 4 daughters in a shipwreck. He knew grief. 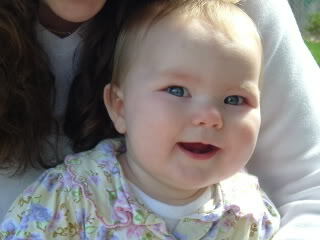 By the end of the day, lying in recovery after emergency surgery at 2 am, I didn't understand why our baby didn't live. I didn't understand God's plan. But I knew this: it really was well with my soul. Though I suffered a loss I couldn't accept, I could be peaceful with my knowledge that God would never leave me to suffer alone. In 2012, finding out that our third child would have Down syndrome was gut-wrenching. Painful. I grieved. But through that time, the words of that same song flowed through my heart like a healing balm. It is well with my soul. It is well with my soul. It is well with my soul. Some nights I sobbed into my pillow as the words ran through my mind. It became my mantra. My lifeline. And soon, every part of my soul was well with Cade's diagnosis. I felt healthy and whole and ready to meet my baby. Over the years, my husband and I have shared many joys and triumphs. We've also shared times of bewilderment, pain, and grief. The failure of our first business. Bankruptcy. The loss of a beloved pet. Miscarriage. Down syndrome. But through it all, we walk together in faith in God. I still don't understand His plan a lot of the time, but I trust in Him. It is well with my soul. Today I saw a photo of a grown man with Down syndrome. 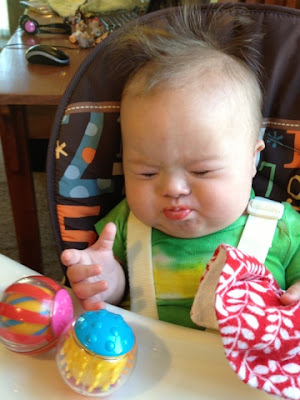 He was everything people think that Down syndrome is...overweight, blankly staring, mouth open. Tears sprang to my eyes as I stared at the picture. I want so much more for you. I expect so much more for you. You will have the best of educational opportunities and therapies, neither of which the man in the photo was likely to have ever had. But, just in case, I'll love you anyway. I expect that you'll be going off to kindergarten before I know it. I expect that you'll learn to read. I expect that you'll run and laugh and play just like your brother and sister. I expect that you'll find a sport you love. I expect you'll like video games. And Funyuns. When you're 3, I expect that you'll choose what clothes to wear each day. And they won't match, just like your older sister and brother never matched when they were 3. I expect you'll wear your shoes backward because you put them on all by yourself. I expect you'll talk a lot. When you're 8, I expect you'll have a best friend and want to spend the night every single night. I expect you'll pass your swim lesson class, and ride a horse, and ride a bike. I expect you'll still talk a lot. If you don't speak a word, ever, I'll still love you. If I tie your shoes your entire life, I'll still love you. If you're 40 years old and your clothes don't match and your shoes are on backward because you put them on all by yourself, I'll still love you. As I look at the photo of that grown man, I remind myself that things are different now. We know that people with Down syndrome can accomplish so much, that the sky is the limit, just as it is with our typical children. You can learn, you can maybe learn to drive, you might even go to college. I expect you to have a chance at those things. But, just in case, I will always love you. Today I had the great pleasure and honor of representing parents of children with Down syndrome during a live discussion on HuffPost Live. I was one of 5 panelists speaking about prenatal testing and the need for counseling after a diagnosis. As a mom who received a positive diagnosis through testing (I had MaterniT21) and received such counseling, I was chosen to be part of the panel. Also on the panel was Dr. Brian Skotko whom I was so thrilled to "meet". 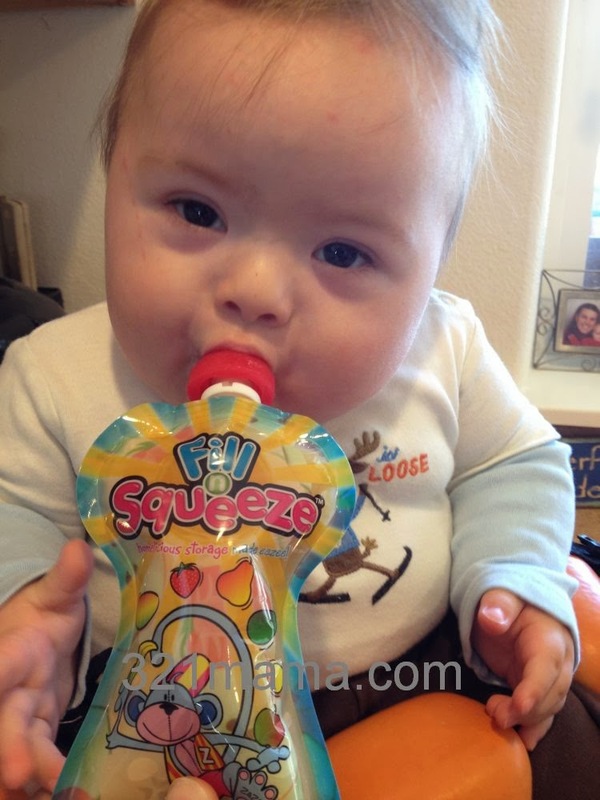 He is the leading advocate and researcher for Down syndrome. Can I ask for a virtual autograph?! Made some new friends, too. Dr. Alison Piepmeier and Stephanie Meredith (co-author of Your Loved One is Having a Baby with Down Syndrome which I have on my bookshelf. For reals.) are both new Facebook friends. They were featured panelists as well. The final panelist, rounding out the five, was Dr. Anne Lyerly, an OBGYN and bio-ethicist at UNC. 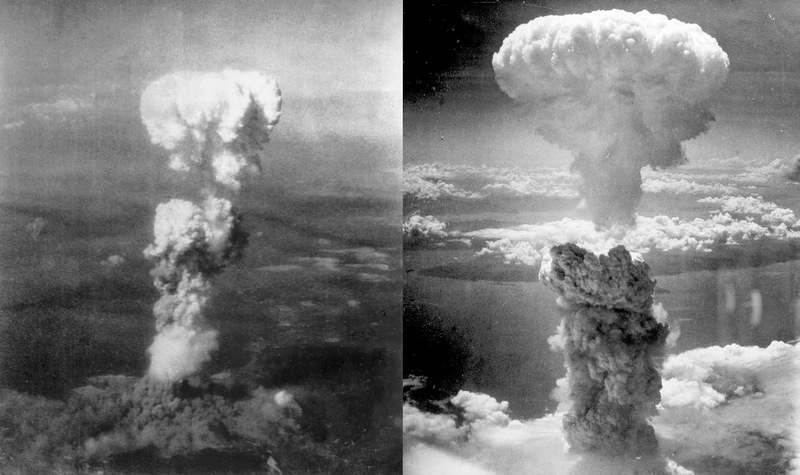 The live discussion was in conjunction with an article released today about the same topic. I am proud to be a part of this as well. 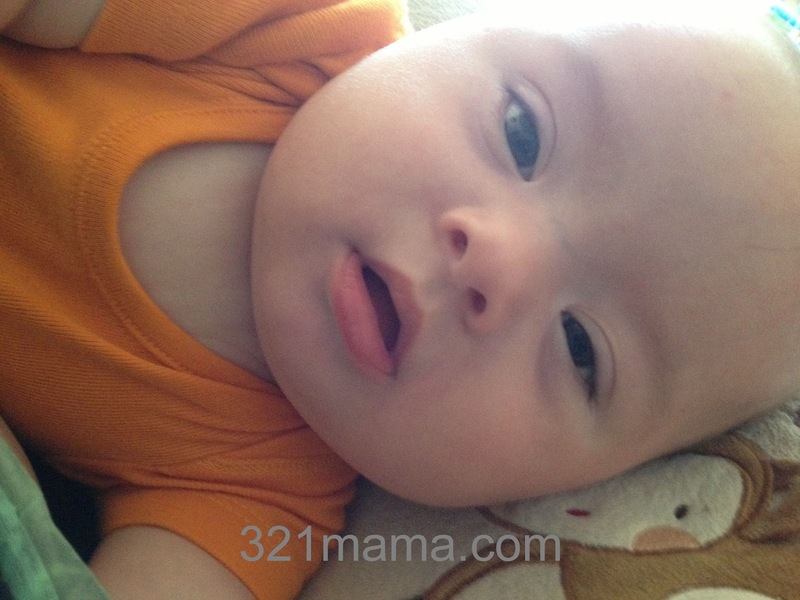 If telling my story helps another mom, wonderful! If I can help be a part of positive change, awesome! Somehow, during my growing up years, I learned exactly how to deal with people who are disabled: treat them as normally as you can while ignoring any obvious disabilities. And if you can't treat them normally for some reason, then ignore them altogether. Pretend the child with autism throwing a fit at the store isn't being loud or that kicking and screaming is perfectly normal. Pretend the wheelchair isn't there. Pretend no one is drooling. I've only been Cade's mom for 4 months, but he's teaching me so much already. Before Cade, I'd have said that the way I dealt with disabilities was fine. Admirable, even. But after Cade, I know that I've missed seeing the real person behind the disability. The person who deserves the dignity of a real response. The person who deserves real respect, even though they're in a wheelchair, or screaming, or drooling, or have almond shaped eyes. It sorrows my heart to realize that all these years, I've been prejudiced against those with disabilities. Not intentionally, of course, but prejudiced just the same. Now, when I see someone with a disability, I look them in the eye. I smile. And when appropriate, I interact. I ask real questions and wait for the answer. I'm still learning, but then, I've only been Cade's mom for 4 months. When I decided to redo Cade's spaces, I tried to think of all of the places he spends time. 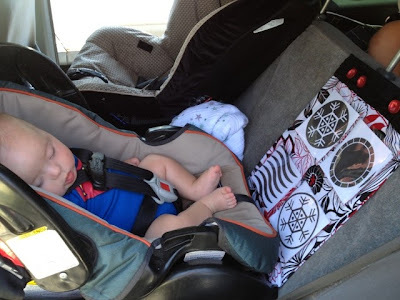 His car seat and crib both made the cut as makeovers since he spends a bit of time in both. My first project was super fast, like 10 minutes. It's a "baby paper" toy with soft, tactile surfaces, ribbons, and crinkly cellophane inside. I chose black and red, but you can do any bright colors. One side is polka dot minky, the other side is some sort of fuzzy fur that's really soft and washes well. It's about 6" x 6". For the crinkly inside, I used discarded packaging from another toy. And I've found it washes in the machine just fine, I just have to hang to dry. 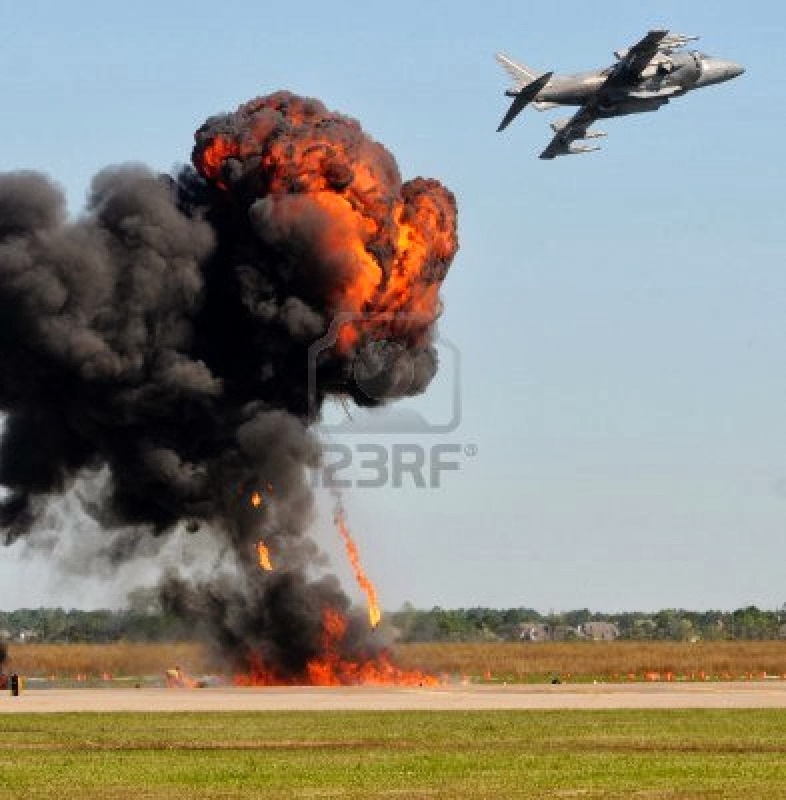 Cade NOTICES this mobile! He loves it like crazy. Now I take him in there just so he can watch the mobile for a few minutes. I haven't done much else with the crib since it's for sleeping and not for play, but making this mobile was totally worth the time (about 2 hours). 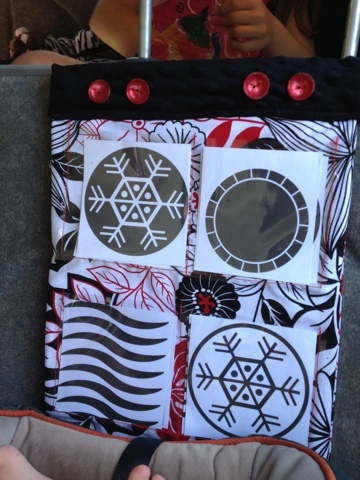 I could have made it faster if I'd used black & white fabric instead, but I liked being able to make whatever design I wanted. I really like how it turned out. Simple, but effective, visual stimulation.